Our MOST popular tour! And for good reason. This tour includes all of our most wanted activities packed into a single day trip. 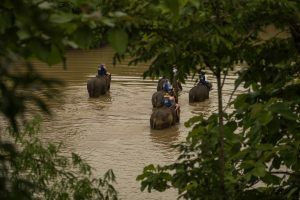 Learn how to be a Mahout and then get ready to get wet as you plunge into the Nam Khan river and give your personal elephant a refreshing bath! Mahout Training: Receive your basic mahout training on how to move with your elephant just like a mahout! Bathe Your Elephant: Take your own elephant down to the Nam Khan river for an exhilarating and once in a lifetime bathing experience! Short but not short on fun! Enjoy the essentials on this, exciting tour. 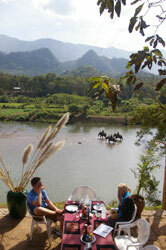 Be a mahout, Lao long boat rides, the Tad Sae Waterfall and a delicious lunch buffet. We’ll have you back to your hotel with plenty of time to enjoy your afternoon plans in Luang Prabang. The true nature lovers tour! 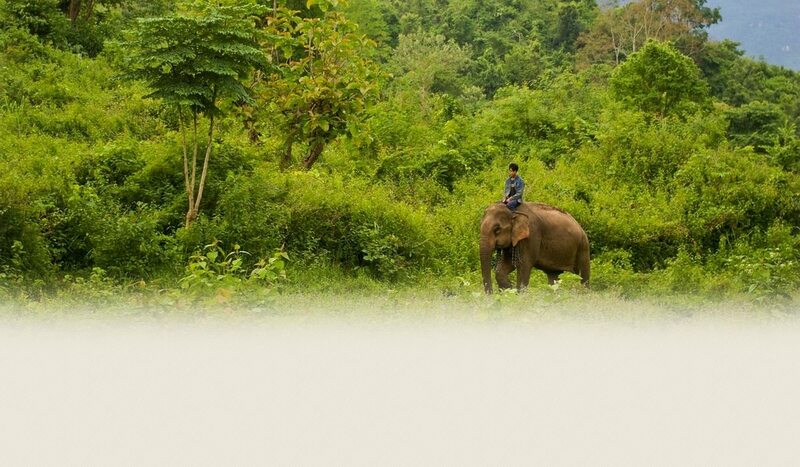 Get it all with this diverse and action packed tour which provides the opportunity to be a mahout, jungle trekking on foot to local villages and a traditional Lao long boat ride. Even your lunch will be an adventure as you picnic in the forrest surroundings. You are sure to be delighted (and exhausted) after this adventure! Boat trip back to camp: Traverse the Nam Khan River in a traditional Lao long boat from the waterfall back to our Elephant Camp. You just might see traditional fishing methods and other various ways with which the local villagers make use of and enjoy the river. Want to REALLY spend the most time with our elephants? Join this 2 day, 1 night adventure of a lifetime. Lots of action and adventure coupled with relaxing down time in our Elephant Camp and cozy Elephant Lodge. It’s everything the M1D tour is… and more! Be a Mahout: Enjoy the impressive experience of being a Mahout, Lao style! 1 person per elephant. important notes: schedules and itineraries are approximate and subject to change due to seasonal conditions in the jungle and at the camp. The Elephant Lodge is a short 6 minute walk along the river from our Elephant Camp. Elephant Village reserves the right to break larger groups into smaller groups and/or operate tour activities in a different order than published above. So that they can earn their own living in close harmony with nature & humans, cared for by professionals and away from abusive work logging work. We create jobs in many different sectors. For example: elephant care takers and food suppliers, restaurant service, house keepers, maintenance staff, boat drivers, chauffeurs, tour guides, gardeners and farmers. This ensures a varied local economy that includes many different skill sets. Because we offer unique and attractive activities as well as a very high level of customer satisfaction, especially outside the busy tourism areas; we help to create extended visits to Laos. This benefits many individual service providers throughout Laos and creates a more sustainable tourism industry. By trekking down our “Trail of Falls” trail, you contribute to our nature conservation project (wildlife habitat), which sets an example for the local community. They see that money can be earned and jobs can be created in a sustainable way, without destroying precious natural habitats. This also means that they can keep alive the skills they already have.